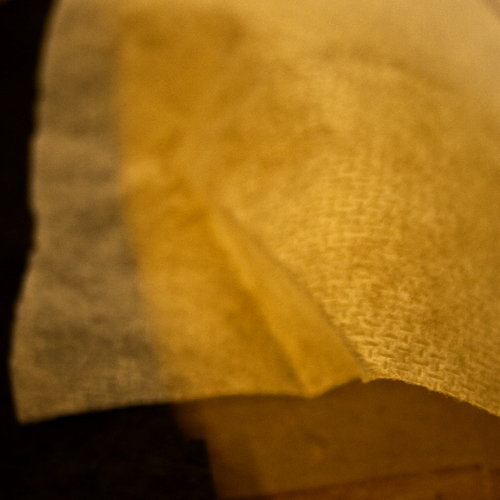 Stiff fabric applied to the inside of the garment to keep the embroidery stitches stable through embroidery, wear, and wash. 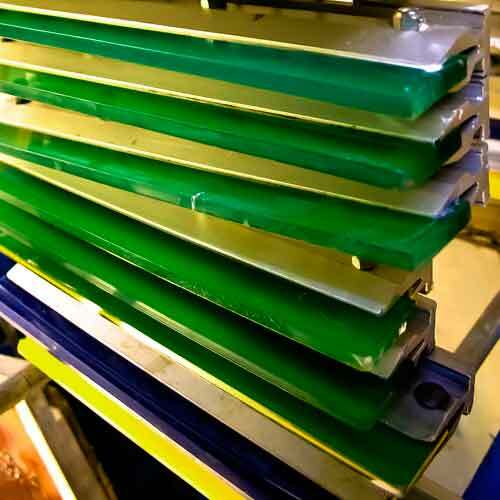 The digital process of separating an image into its individual color components to be printed as film positives, then burned onto screens for printing. Inks must be set or dried after printing. Unlike water-based inks, plastisol inks will not dry on their own and must be ran through a high temperature dryer to set. 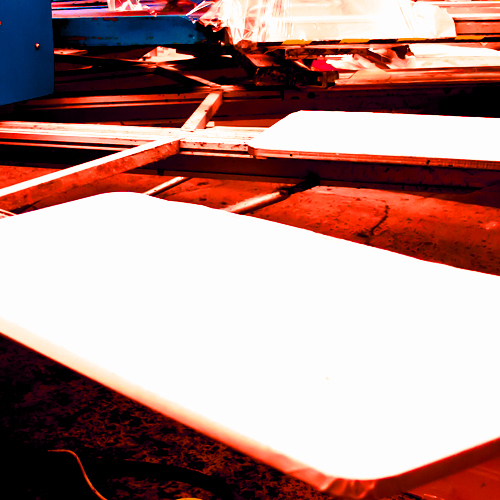 For standard plastisol inks we run the garments through a large dryer on a belt for 2.5 minutes at a temperature of 350°F. Water-based inks will dry on their own if left to sit, but are also cured to speed production time. Water-based inks require higher temperatures and/or longer dry time than plastisols in order to evaporate all water from the ink. 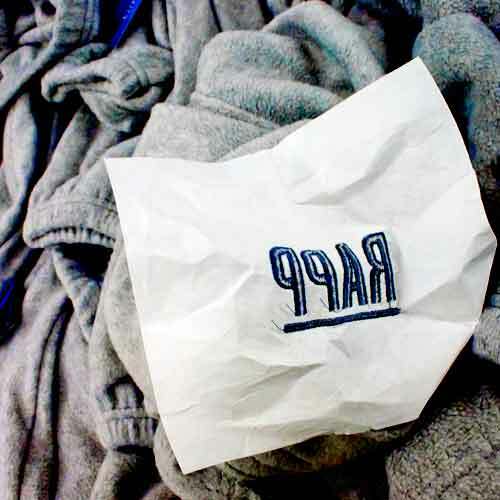 Cut away is used on softer materials that we embroider. 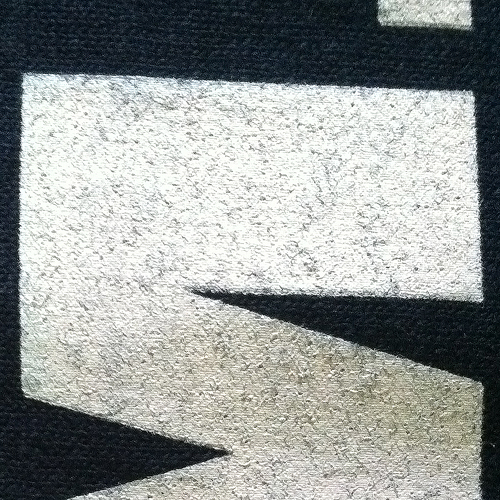 This type of backing eliminates the tendency of a fabric to pull away from the embroidered logo when using tear away. We use cut away backing on knit fabrics such as pique. 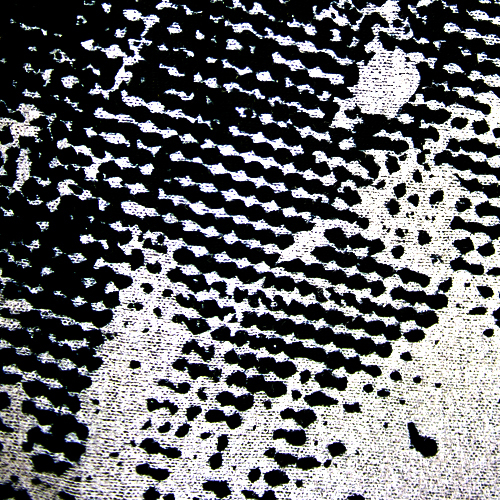 Discharge is a water-based ink developed for dark garments. It is mixed with an activator that bleaches the fabric threads while depositing pigment. 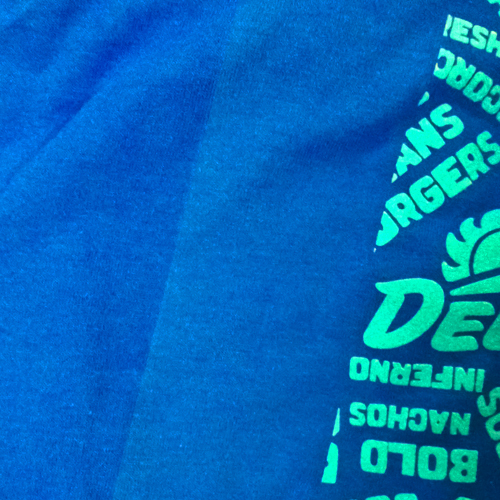 Discharge has a different aesthetic than standard plastisol inks. 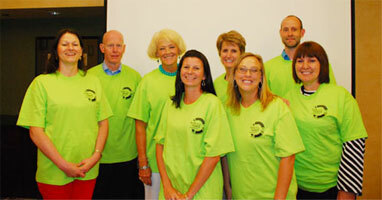 Be sure to discuss limitations of water-based printing with a screen print artist or custom service representative. 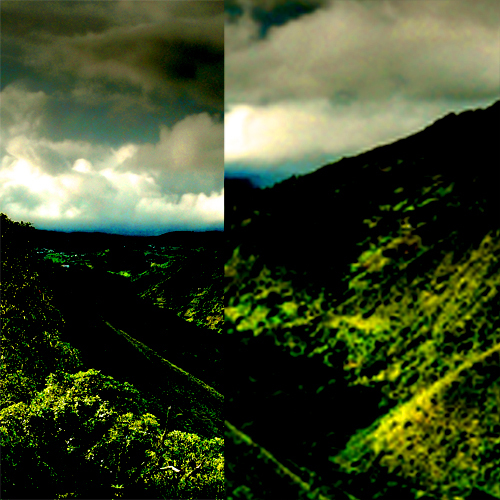 Halftones are frequently used to blend colors and create fades and shades in digital art . When ink is pushed through a screen stencil using halftone dots, the ink spreads making the dot larger on the print than on the film. The amount of increase is referred to as dot gain. For example, inks that are more viscous or "watery" have a tendency to have more dot gain. 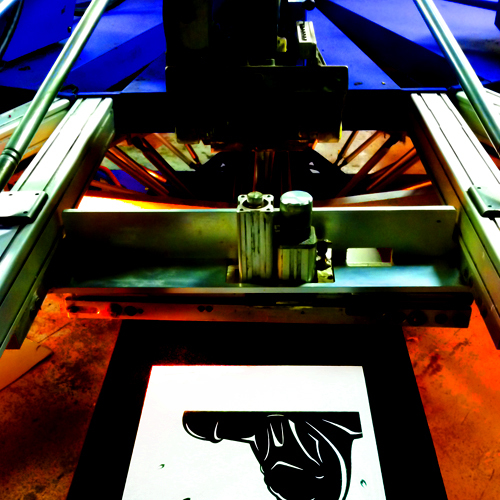 Durometer refers to the hardness of a squeegee used for screen printing. In general the higher the number, the harder the plastic that makes the squeegee. 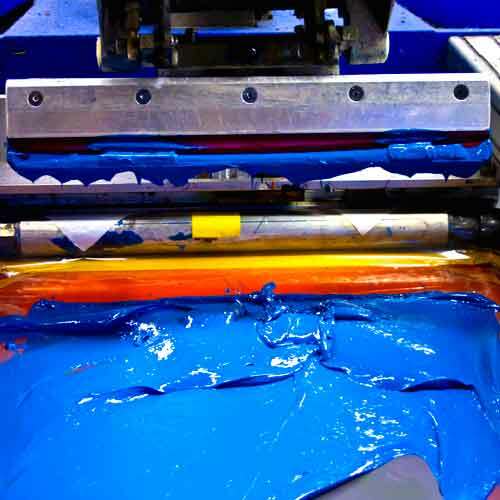 Softer squeegees assist in applying more screen print ink, whereas harder squeegees deposit a lighter layer of ink and are often used to assist in capturing detail and lower halftones. Dye migration is when the dye from a garment contaminates the screen print ink color causing the print color to appear tinted. For example, white ink on a red shirt will appear pink when dye migration occurs. Dye migration is likely on poly-cotton blends and 100% polyester garments. Performance garments, such as running shirts are very likely to have issues with dye migration. Other highly pigmented t-shirt colors likely to experience dye migration are bright royal, red, purple, teal, and black, but other colors can migrate as well. We often test swatch shirt samples for the likelihood of dye migration, however, migration can take up to a week to occur and cannot always be identified before hand. The instance of dye migration can vary through a production run. We use inks to reduce the possibility of dye migration, however none are 100% effective in our experience. This backing is used only when requested as there is an additional cost. Cut away and tear away backings are sometimes a little visible on light colored garments or very thin material. 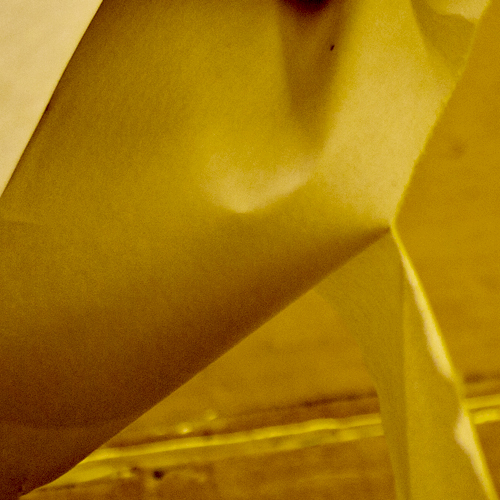 Fabric backing is silky, super light and barely visible on even the most fragile materials. Used to burn a stencil onto a screen for printing, the film positive is created by printing black ink on a clear plastic surface. Each design has one film positive per color. When screen printers talk about gradients, we are referring to a series of halftones created when a digital graphic transitions from a darker to lighter shade. These gradients can be layered to create printed blends when transitioning from one color to another. Halftones are dots or ellipses used to create lighter shades of a print color without changing the actual ink color to something lighter. Smaller dots spaced farther apart, create a lighter shade. Larger dots spaced closer create a darker shade. The density or darkness of halftones is referred to in percentages. For example, a completely solid fill is 100%. A dark shade would be around 80% and a lighter shade around 20%. When printing designs that are photographic or a lot of colors, color separators layer different halftone percentages of different inks to blend colors. This rather unknown piece of screen print equipment is invaluable! On occasion a pinhole will develop in a screen and print unwanted marks on shirts before the spot is realized. 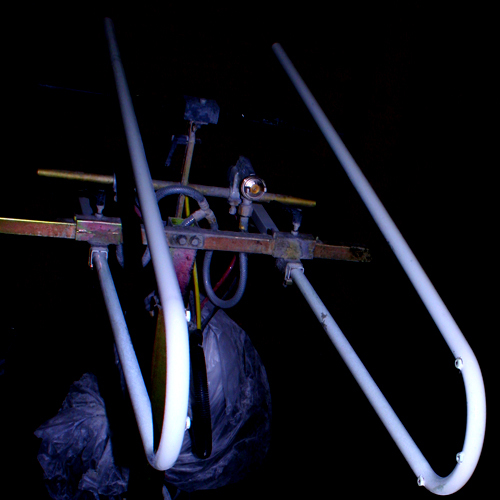 A kreb gun is used to spray out small unwanted spots of cured plastisol. 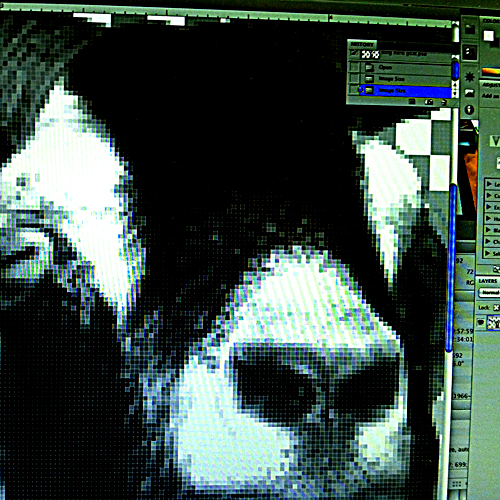 Line count refers to the number of vertical lines of halftone spots per inch or lines per inch. Line counts are measured in lpi (lines per inch) and/or dpi (dots per inch). Most shops will use anywhere from 45 lpi to 85 lpi depending on the desired affect. Higher line counts can hold more detail, but tend to print with less saturation than lower line counts. Mesh is the fabric stretched over a frame to make the screens used in screen printing. The mesh is a grid weave of synthetic nylon or polyester thread. 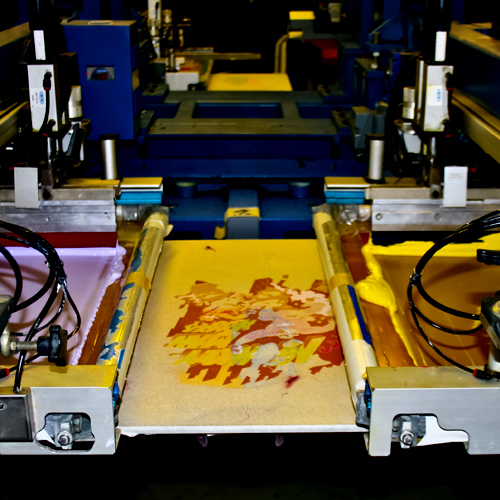 The process of screen print used to be called silk screen because silk threads were used. 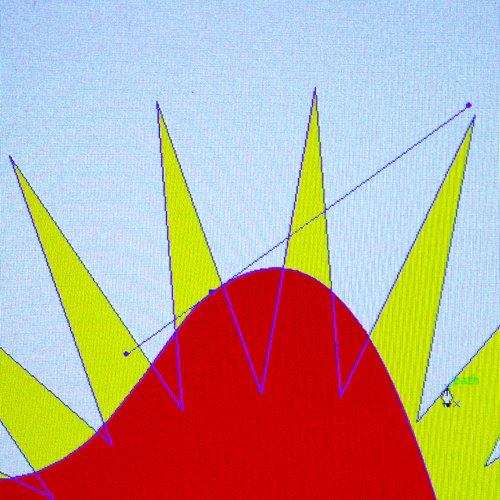 Mesh count refers to the frequency of threads per inch making up the fabric for screen print. A higher mesh means more threads that are closer together. 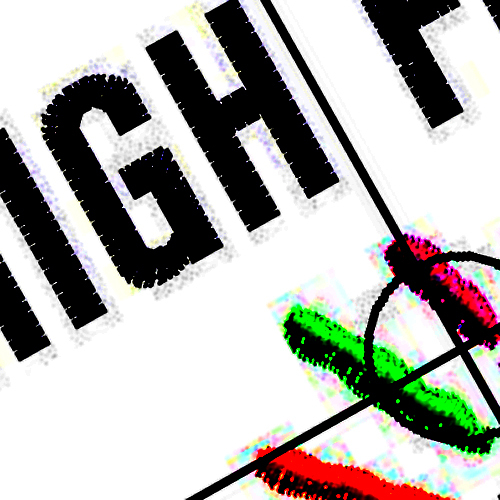 Higher mesh counts are better for holding detail, but also print inks with less saturation. Lower mesh has larger openings between the threads and allow more ink to pass through. This means the stencil created on the screen can be printed with more saturation, but cannot hold as much detail. Off contact is an air gap between the bottom of the screen (print side) and the top of the item you are printing. This gap allows the screen to snap off the garment after a squeegee pass. A pallet is the flat surface onto which a t-shirt or article of clothing is loaded for screen printing. 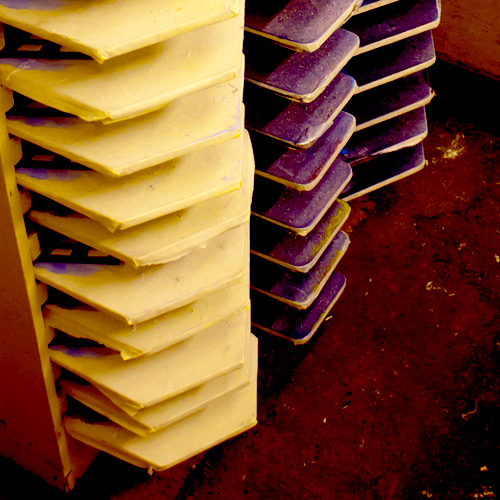 Pallets are also referred to as tables by screen printers. 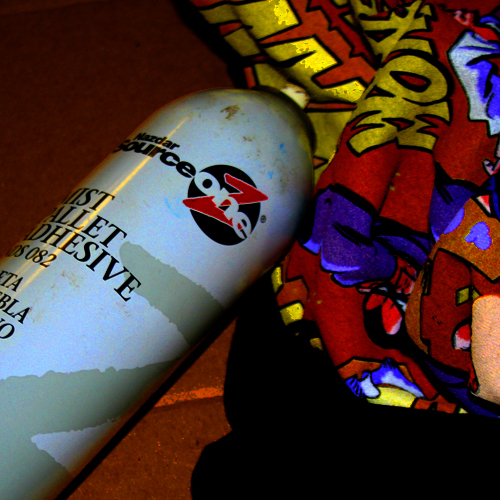 A light spray adhesive is used to stabilize a t-shirt or article of clothing on a screen print table or pallet. The adhesive is referred to as tack or spray tack. Sometimes the tack will leave a slight residue that causes the t-shirt to appear slightly discolored. The discoloration is called a pallet mark because it is in the shape of the pallet. This is a common occurrence in the industry. Although we make every effort to avoid pallet marks, sometimes they are inevitable. The spray tack is water soluble and disappears upon washing. PC stands for pigment concentrate. Pigment concentrate combinations are measured out by gram and mixed with a base to create Pantone ink colors used for screen printing. Phthalates are esters of phthalic acid and are mainly used as plasticizers (substances added to plastics to increase their flexibility, transparency, durability, and longevity). They are used primarily to soften polyvinyl chloride. Phthalates are being phased out of many products in the United States, Canada, and European Union over health concerns. A pin hole is a teeny hole - the size of a pin head - in a stencil on a screen for print. These pin holes allow ink to pass through the stencil printing small dots on a garment in unwanted areas. Pin holes can occur for a number of reasons. 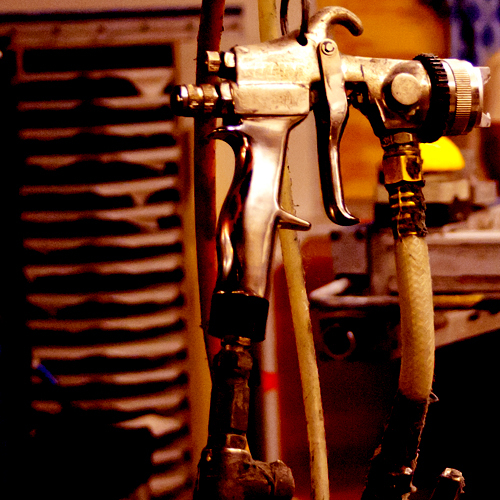 The most common is a natural breakdown of the stencil emulsion during long production runs. Under exposure of a screen during the burning process is another cause of pin holes. 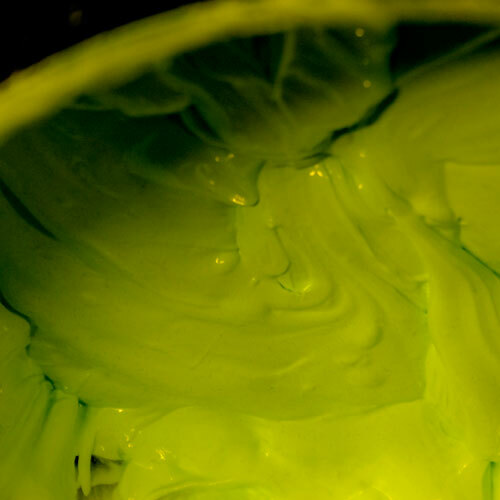 Plastisol is a type of screen printing ink that is not water-soluble. The ink is composed of PVC particles suspended in a plasticizing emulsion, and will not dry if left in the screen for extended periods. Because of the convenience of not needing to wash a screen after printing, plastisol inks can be used without a source of running water. 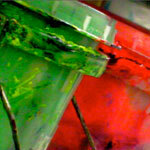 Plastisol inks are recommended for printing on colored fabric. 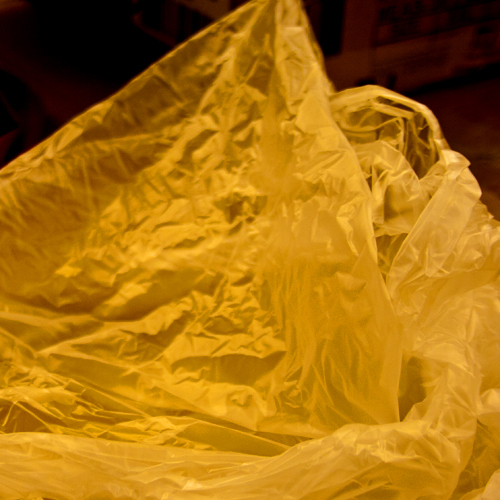 On lighter fabric, plastisol is extremely opaque and can retain a bright image for many years with proper care. PVC free ink has been formulated without toxic phthalate plasticizers. 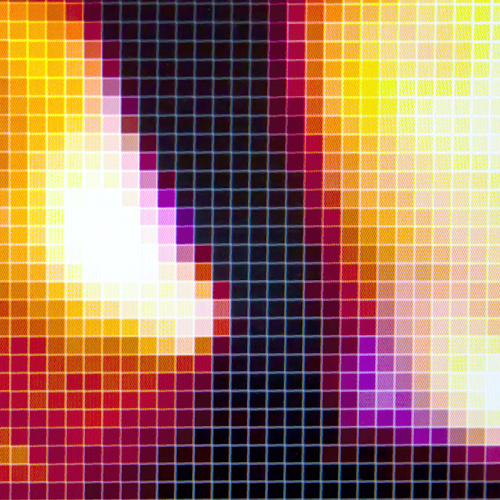 Digital art composed of pixels (as opposed to paths) is a raster file. Raster files for screen print are best created in Adobe Photoshop at a minimum resolution of 150 dpi at print size. Resolution refers to the quality and clarity of raster art files. 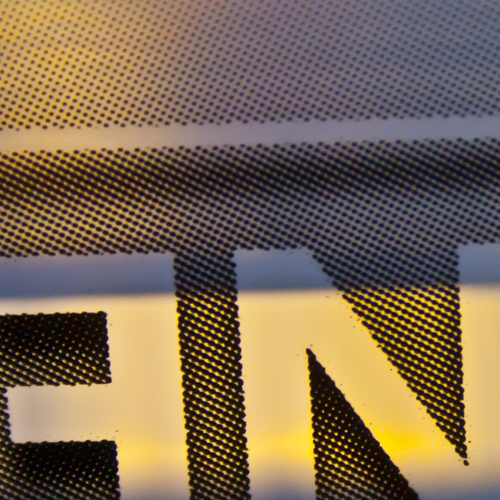 The higher the resolution, the cleaner and more clearly a print can be produced. The acceptable minimum resolution for screen print is 150 dpi at print size. 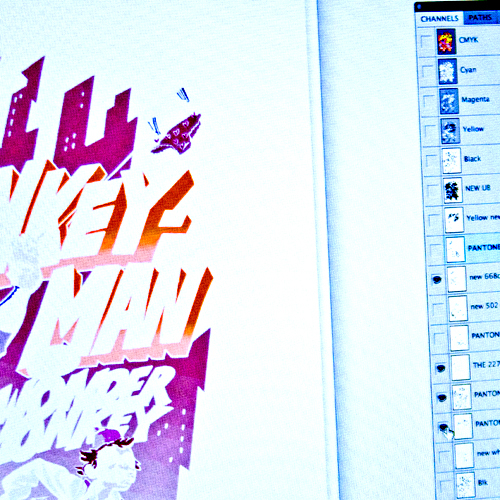 Files must be created at the minimum resolution for screen print and cannot be up-sampled. Web graphics are 72 dpi and can never be used for screen print. If a digital file with 72 dpi resolution is submitted for printing, it is likely the logo can be redrawn for an art charge. The "hand" of a print is the tactile nature of a print. A print with soft hand is more flexible, less noticeable, and softer than a standard print. Soft hand prints are achieved by using ink additive, higher mesh counts, or water-based inks. The squeegee is the piece of equipment that moves ink across the screen. It is composed of two parts. Part one is a rectangular piece of rubber. The rubber used is specially manufactured for screen printing and can have varying degrees of flexibility notated by durometer. Part two is a handle or casing that holds the rubber. On automatic presses the casing is metal and attaches to the press arm. 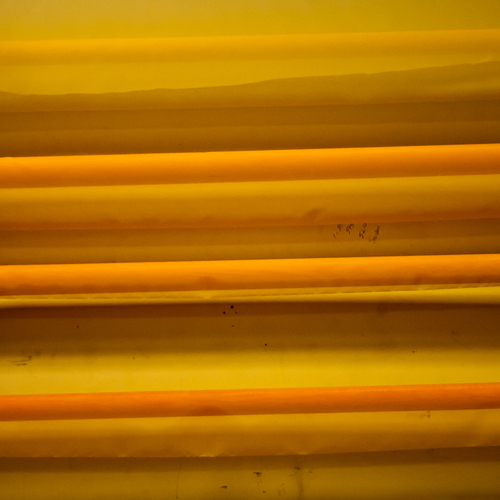 Squeegee handles for manual presses are usually wood and are hand pulled by the press operator. Starching is the term used when referring to the t-shirt preparation for all-over printing. 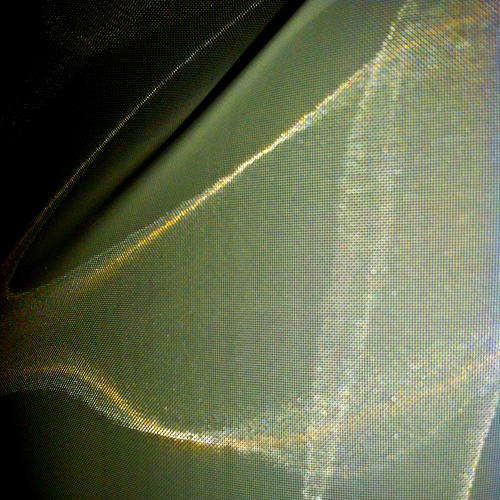 A starch-like mist is sprayed inside of the garment. This mist has a tack to it, keeping the garment flat and closed while printing on top of a flat table. 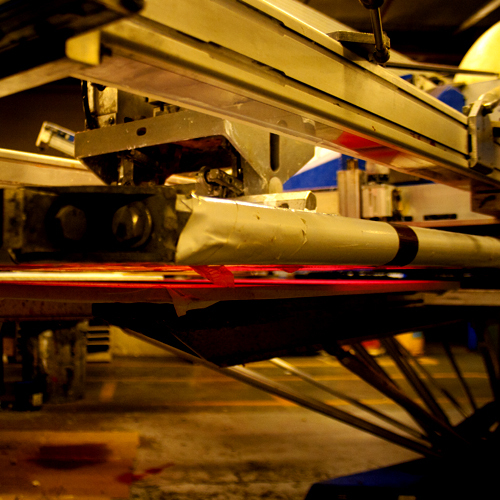 Shirts are loaded onto a flat surface that moves around the press stopping at each color station for printing. The pallet we pull the shirt over is often referred to as a table. 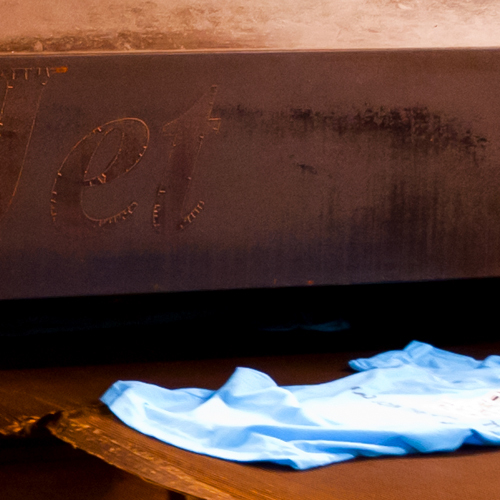 A light adhesive is sprayed on the press pallet to stabilize the t-shirt and keep it from lifting up in the printing process. This adhesive is often referred to as tack or spray tack. Although a residue may be left in the shirt, the tack is water soluble and comes out easily when washed. Tear away is the most common type of backing used. It is the quickest and easiest to remove for the most common types of embroidered garments ordered by our customer. 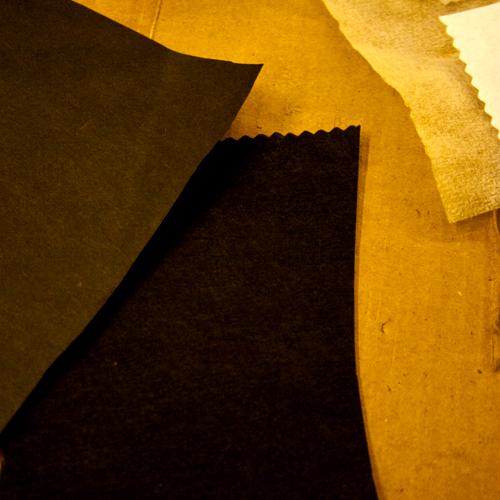 Tear away backing is used on the sturdy, strong fabrics such as caps, dress shirts, back packs etc. When printing on dark colored garments, a layer of white ink must be printed first, so the actual logo or design print colors are visible. Some screen printing inks are more transparent than others and will be over powered altogether or visually contaminated by the garment color. The under base is also commonly referred to as underlay, white underlay, white under base, flash white, or simply base white. Up-sampling is taking a piece of low resolution digital art and merely re-assigning the dpi value to a higher resolution in Photoshop. This does not actually increase the size or quality of the image. 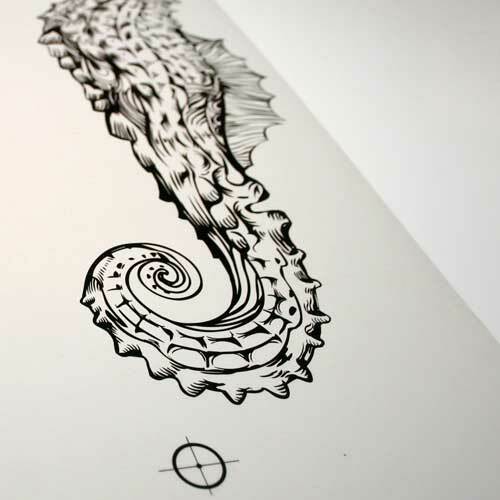 Low resolution art files must be completely redrawn or created in an acceptable file type for use in screen printing. Vector, in the screen print industry, refers to a type of digital file that is acceptable for use. The images are created using paths instead of pixels. Pixels are used in raster files. Vector programs include Adobe Illustrator (preferred) and Corel Draw. Water-based inks are defined as those that utilize water as the main solvent. That does not mean, however that water is the only solvent. It is significant to note that many water base inks contain “co-solvents” which may even be petroleum based solvents. The reason these co-solvents are used varies, but one of the key reasons is to decrease the time and heat necessary to cure the ink film on the fabric. Water-based has a different aesthetic than standard plastisol inks. Be sure to discuss limitations of water-based printing with a screen print artist or custom service representative. 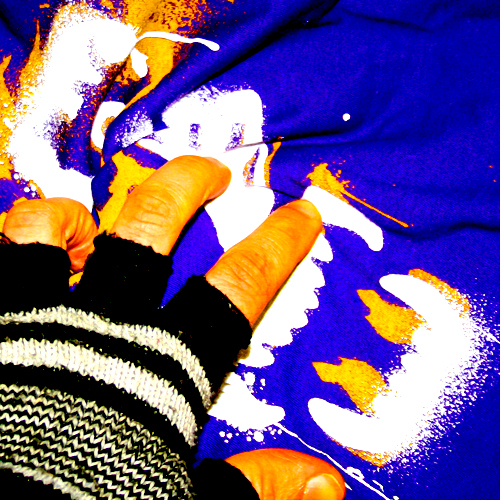 Wet-on-wet is a screen print technique used most often when a design has a large number of colors and uses simulated process separations. 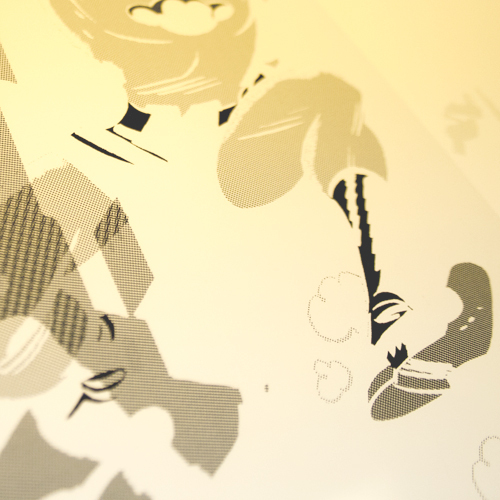 For simpler design and spot color designs, the under base is flashed to cure inline on press. By voiding the flash, the underbase print remains wet - wet inks printed on top of a wet underbase. Printing wet-on-wet allows for better blending.